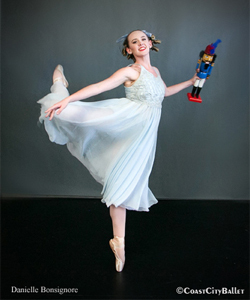 Coast City Ballet proudly presents The Nutcracker Ballet at Huntington Beach Historic Auditorium. Based on the original choreography by Marious Petipa and Leon Ivanov, under the direction of Clara D'Autilia, Coast City Ballet's The Nutcracker captures the enchantment and magic of this timeless holiday favorite. 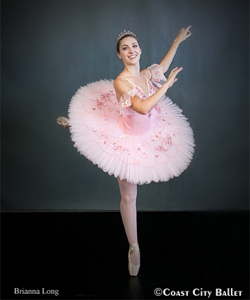 First presented in 2004, Coast City Ballet's The Nutcracker has since become one of the most beloved and entertaining productions in Southern California. 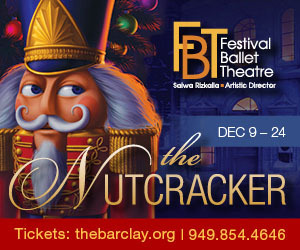 Featured guest artists, Coast City Ballet students, company members, and dancers from throughout California come together to present the story of Clara and her beloved Nutcracker in this family friendly production. Magic tricks, splendid costumes, the delightful story, the joyful dancing, and Tchaikovsky's enduring music will captivate children and adults alike. Join Clara as she journeys through an enchanted forest where snowflakes dance in ever-changing patterns, see toys come to life, marvel in the enchantment of this fairy tale ballet, experience the magic of dance!? December 12, 7:00 p.m. and December 23, 2:00 p.m.